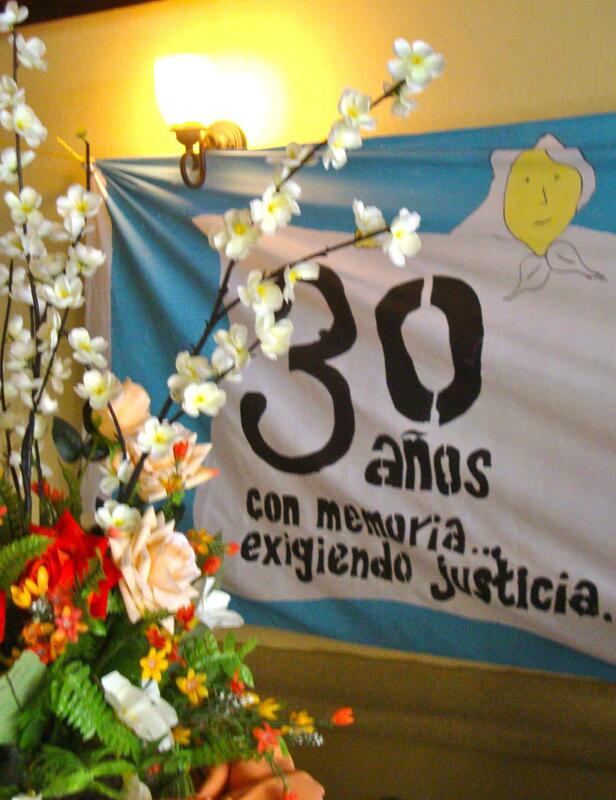 Just two weeks after celebrating its 30th anniversary the Committee of Relatives of the Detained and Disappeared in Honduras (COFADEH) announced (link in Spanish) their intention to present four cases of human rights violations before the International Criminal Court (ICC). According to a December 14th press release these cases are emblematic of the impunity of human rights offenders in Honduras as well as of the influence of United States hegemonic hemispheric security policy. 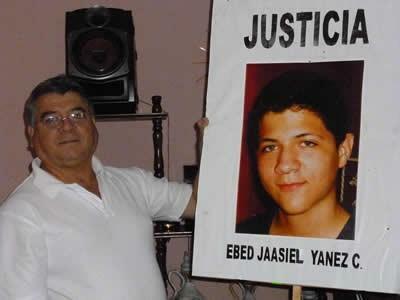 Ebed Yanes‘s father (link in Spanish). The 15-year-old was killed by the Honduran military. The case is one of 4 to be presented to the ICC. The four emblematic cases COFADEH will present to the ICC are symptomatic of a system of impunity in which the U.S. government has a heavy hand. Each of the cases point to U.S. involvement in rights violations and impunity for the perpetrators. 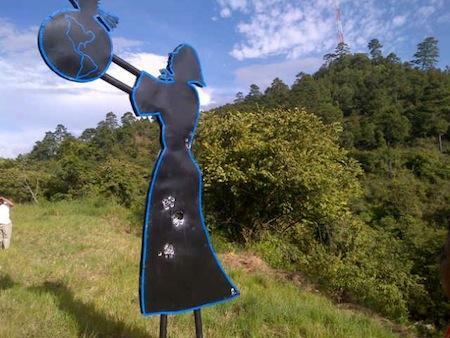 In the Ahuás case, the role of U.S. DEA agents in the May 2012 massacre of indigenous villagers is addressed. Preliminary conclusions released in annex to COFADEH’s press release on December 14 state, “In the Ahuás case evidence threw light on direct intervention of U.S. agents in favor of the killers and in the interruption of criminal process.” They also highlighted the militarization of the country as a direct result of U.S. influence and a direct cause of human rights abuses in Honduras. COFADEH is recognized as one of the foremost authorities on human rights in Honduras. Founded in the 1980s in response to the massive detentions and disappearances of that decade, the organization has grown from a small group of women demanding justice for their loved ones into a leading organizational force in the field of human rights. Members of COFADEH are regularly threatened for their work. COFADEH as an organization has been granted protective measures by the Inter-American Human Rights Commission. Most recently, journalist Dina Meza reported threats she received on November 19, 2012. These follow threats made against her in April, which were denounced by international human rights organizations including Amnesty International. COFADEH declared 2012, the year of their 30th anniversary, to be the “Year Against Impunity.” In commemoration, the organization raised a monument on August 30th, the International Day of the Disappeared, at the site of an unmarked grave exhumed in 1995 5 kilometers outside the city of Danlí. Days after the dedication, the monument was riddled with bullets and 50 days after its installation it was disappeared. COFADEH General Coordinator, Bertha Oliva denounced this attack on the memory of the disappeared at the organization’s 30th anniversary celebration. COFADEH celebrated its anniversary on November 30, 2012 with a discussion forum in the morning followed by a concert the same evening. The forum, “Historic Memory and Impunity,” began with presentations by Lisa Sullivan (SOA Watch), Bertha Oliva (COFADEH), Ludivina Hernandez (COFADEH), and Oscar Aníbal Puerto (Honduran Institute for Rural Development, IHDER). During his address Mr. Puerto said, “We are celebrating the anniversary of the moral reserve of this country.” Lisa Sullivan underscored the role of the U.S. in Honduras and shared a symbolic story from her plane ride into Tegucigalpa when a Honduran man fainted and three North American doctors came to his aid. She noted that instead of stealing his wallet and his shoes in his defenseless state, they assisted the man and helped to revive him. “That’s how relations between our countries should be,” Sullivan said. Bertha Oliva stressed the importance of memory to ensure that history does not repeat itself. COFADEH’s anniversary was also celebrated in London where COFADEH lawyer Kenia Oliva was visiting at the time. From 20 to 24 May 2012, a commission organised by COFADEH (the Committee of the Families of the Detained and Disappeared in Honduras) visited La Ceiba and La Moskitia to document the tragic events of 11 May, when four passengers in a river boat were killed when they were shot from helicopters during a joint antinarcotics operation by the Honduran police and the US Drug Enforcement Administration (DEA). During its mission, COFADEH received accompaniment by PROAH, including a representative from Witness for Peace. COFADEH presented the preliminary report of this mission at a press conference on 6 June. The passenger boat fired upon by helicopters. The bullet holes can be seen on its side. There was – and there still is – an urgent need to clarify the facts surrounding the case, not only because of the seriousness of what occurred, but also because of the series of statements by the authorities, US and Honduran, justifying the attack by implying that the victims were involved in the drugs trade. COFADEH’s mission managed to shed light on many of the key facts, as well as giving a face to the innocent victims, and a voice to their relatives and others affected by the attacks. We travelled to Ahuas, the municipality in La Moskitia where the tragedy occurred, and home to most of the victims and their relatives. Its name, which means ‘pine’ in the Tawahka language, has a particular resonance for those who remember the militarization of Honduras by the US during the 1980s – Ahuas Tara (‘Big Pine’) was the name of a series of major joint military operations between the US and Honduras in La Moskitia in the context of the Contra War over the border in Nicaragua. 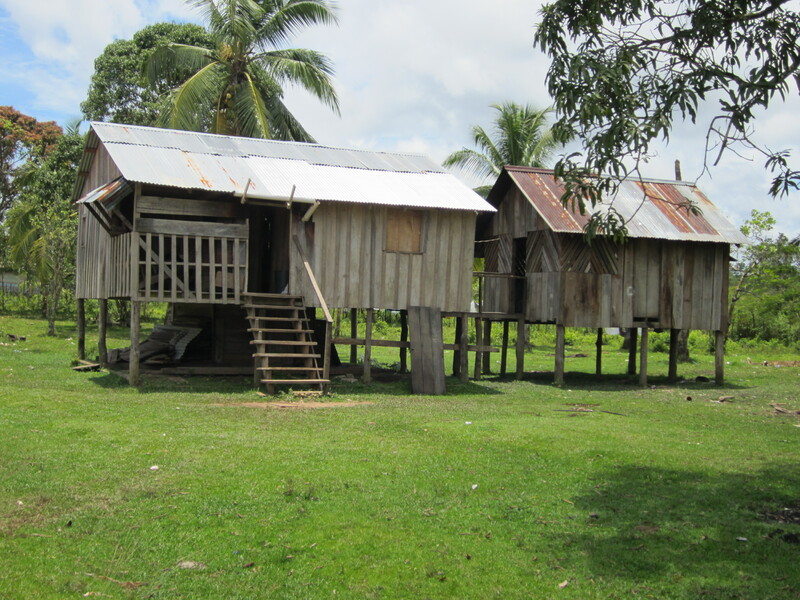 The journey underlined the remoteness and isolation of the region. We travelled in a small plane (about 20 seats) over the jungle of the western Mosquitia, and then in an even smaller plane (a 4-seater) flying low over the grasslands in the east of the region, which provide easy landing strips for drugs planes. In a region where there is only one main road, air and water are the usual means of transport for the local people. When we arrived, we were taken to the ‘landin’, the small river port in Paptalaya, a small community in Ahuas municipality, close to where the tragedy happened, and where the boat was due to dock before it was fired upon by four military helicopters at 2 am on 11 May. The boat was still there, complete with 20 bullet holes in its sides. One of the ‘factors’ which made its passengers suspicious in the eyes of US officials was that they were travelling at night. 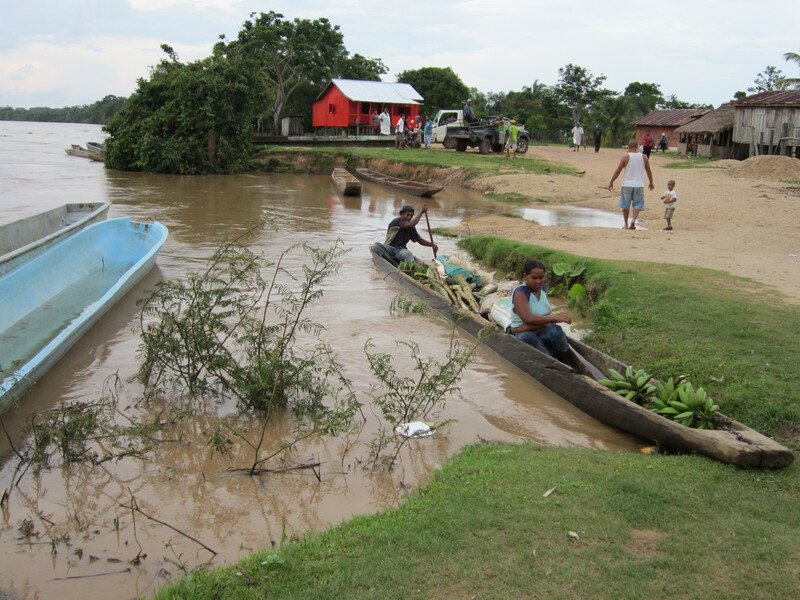 However, this is normal practice for long river journeys in a region where the strength of the sun during the day is fierce, and looking at the boat – a pipante, essentially a long canoe – it was easy to see that it was so narrow that putting a roof on it would have destabilized it. The ‘landin’ at Paptalya where the passenger boat was due to dock, and where the helicopters landed. Information on the events leading up to the tragedy were provided by the local mayor, Lucio Vaquedano, who has been praised by COFADEH for his bravery in publicly stating the facts surrounding the case, and in contradicting the versions of the Honduran and US authorities who, immediately after the tragedy, claimed that the dead were drug-traffickers. In an interview with COFADEH, he stated that, according to accounts he had heard, a light aircraft had landed on an illegal runway 3 kilometres away to leave a drugs shipment, which was possibly already tailed by the police and the DEA. The cargo was taken to the dock at Paptalaya where it was transferred to a boat. 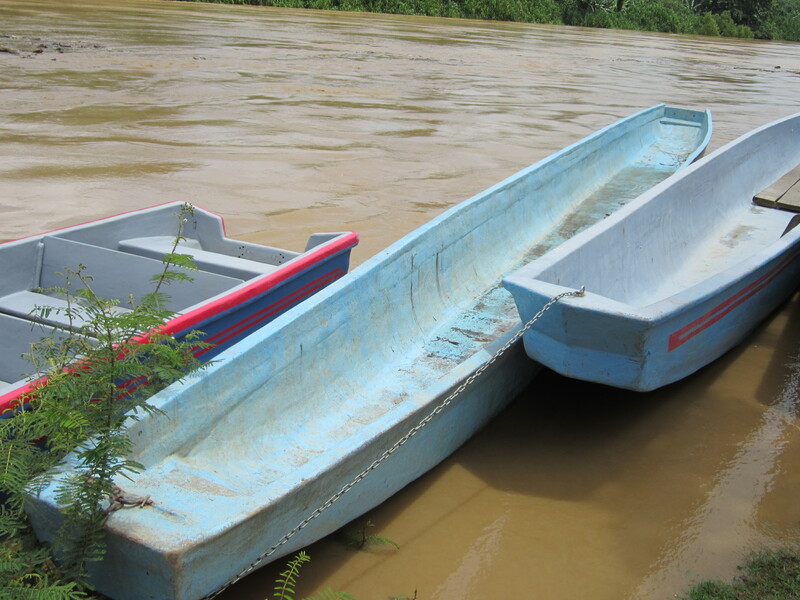 The employees of the drugs traffickers fled when they realized they were being tracked, abandoning the boat which then drifted down the Patuca River. The passenger boat, which was travelling upriver, was about 700 meters away from the landing at Paptalaya when it came across the boat carrying the drugs. Just at that moment, the police and the DEA attacked, opening fire on the passenger boat. For Mr Vaquedano, it was a mistake that unfortunately took the lives of four innocent people. The dead were Hasked Brooks Wood, 14, a minor travelling with his mother Clara Wood Rivas, and three adults, all of whom were parents, and two of whom were pregnant women – Candelaria Pratt Nelson, 48, who was from Brus Laguna, on the coast, and the mother of 6 children, and Juana Jackson Ambrocio, 28, the mother of two young children, who lived in Ahuas. The other adult, Emerson Martinez Henriquez, 21, was the father of two girls, and had left the army only a month earlier after three years of military service in the 5th Infantry Battalion in Mocorón, Gracias a Dios. Further details of the attack came from interviews with the boat’s survivors. They insist that no warning was given before the helicopters fired upon them, and that no other shots were heard, although as late as 10 June the Honduran authorities were reported as claiming, on the basis of a preliminary investigation, that the agents on the helicopters were justified in firing in self-defence. What is certain is that there was no attempt by the personnel in the helicopters to help the passengers once the attack took place. Given that they included children who could not swim, it is a miracle that not more people died, as the passengers were forced to jump in the river to escape the firing, which continued while they were in the water. Three of the injured, from their hospital beds in La Ceiba and Ahuas, told COFADEH how, despite their injuries, they managed to swim to the river bank. There, two of them, Wilmer Lucas Walter, 14, with a severe injury to his wrist and Lucio Adan Nelson Queen, 22, shot in the back and elbow, fled into the trees to save themselves when they saw that the attack was continuing. The third hospitalised victim, the boat owner, Hilda Rosa Lezama Kenreth, 53, was hit by a high-calibre bullet which left a groove 4 inches wide and 12 inches long across her thighs. She was in the river for over two hours, sheltering under a bush from the attack. She was forced to spend so much time in the polluted water that she contracted an infection in the wounds, and at one point there was the risk that both legs would have to be amputated. What she did not know at the time was that her son had been prevented from rescuing her by agents – reportedly both American and Honduran – from the helicopters, who spread terror among the community after landing at the dock at Paptalaya. They detained him for an hour and beat him, forcing him at gunpoint to recover the boat containing the drugs. This was only one example of a series of reported abuses by the Honduran and American agents, who violently broke into houses, looted fuel, ill-treated the inhabitants and subjected some to death threats. One of the survivors of the attack, Clara Wood Rivas, and the mother of one of the dead, Hasked Brooks Wood, 14, had arrived distraught at the landing, after swimming ashore, only to be threatened at gunpoint by three agents, who asked her if she wanted to die and told her to get out of the area. This failure to help the passengers of the boat extended to the care of the wounded, both immediately after the incident as well as longer term – all help for the injured was arranged by the people of the community, with no support from the authorities. In the end, Lucio and Wilmer spent over 20 days in hospital in La Ceiba without being operated on – in the case of Lucio, the operation was cancelled at the last minute a number of times, and it was finally carried out only after UNICEF and the International Committee of the Red Cross intervened at COFADEH’s request. In the case of Wilmer, his mother, who is single and in a precarious financial position, had to find the money to pay for an ambulance to transport her son to San Pedro Sula for the surgery which would save his hand. At the end of their mission, COFADEH initiated legal cases on the incident by lodging official complaints with the Public Prosecutor’s Offices in Puerto Lempira and La Ceiba, as well as later at the Head Office (Ministerio Público) in Tegucigalpa, with the presence of the victims’ relatives. In their preliminary public report, COFADEH are not only demanding due support for the victims and their relatives, but also that both the US and Honduran authorities conduct investigations into the incident, which has had such a bitter cost in innocent lives.